Have a question? It might be one we get a lot, so please take a look at our Frequently Asked Questions to find your answer quickly. A. As soon as possible! We want you to be happy, and we want you to wear our shirts! Our manufacturing team is currently working their tails off to replenish our inventory. Although we don't have specific dates available, please check back often! How come every design isn't available in every body style? A We generally expand our collections based on the design's performance. If something is selling well, we take note! How can I find what I'm looking for on your website? A. Try out the Search Bar! It's really easy – just type in what you are looking for. Go ahead, type in the word "cat" and see what happens. You'll find all your new favorite cat shirts all on one page! If you still can't find what you're looking for, give us a call. We've got an advanced team of hawkeyed gumshoes ready to hop on the case. 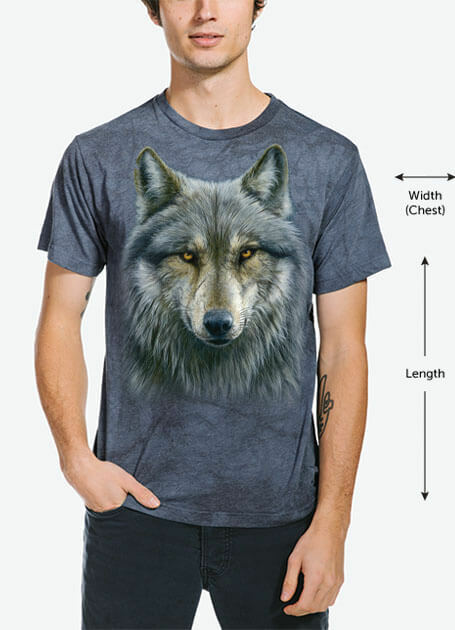 Can you print a shirt with my image on it? A. 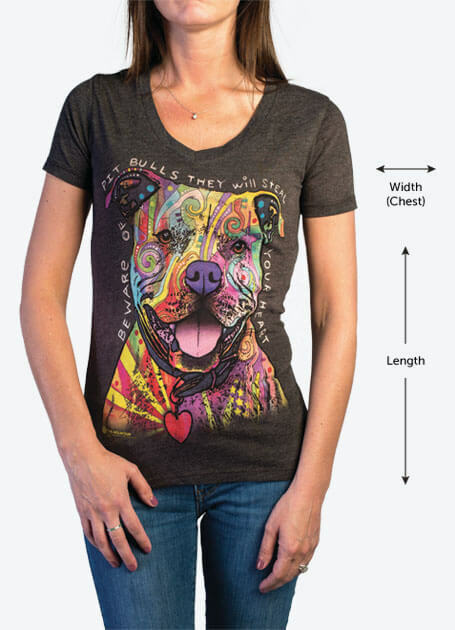 So you have a shirt with your dog on it, and now you need a shirt of you for your dog. You're in luck; our wholesale department does offer customizing services! 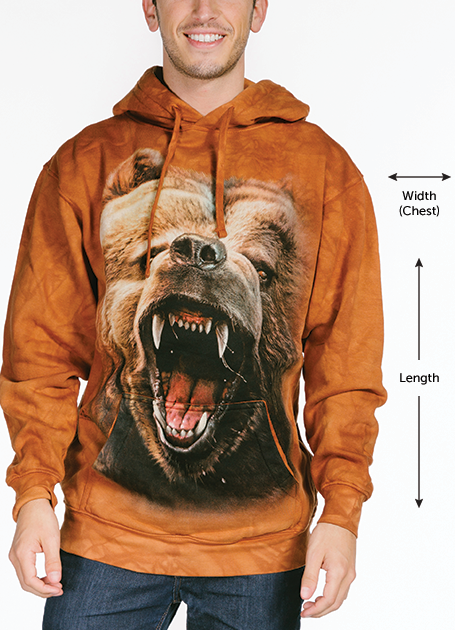 You can learn more about custom printing options here (http://wholesale.themountain.com/pages/custom-printing-options) or by contacting our customer service. A. 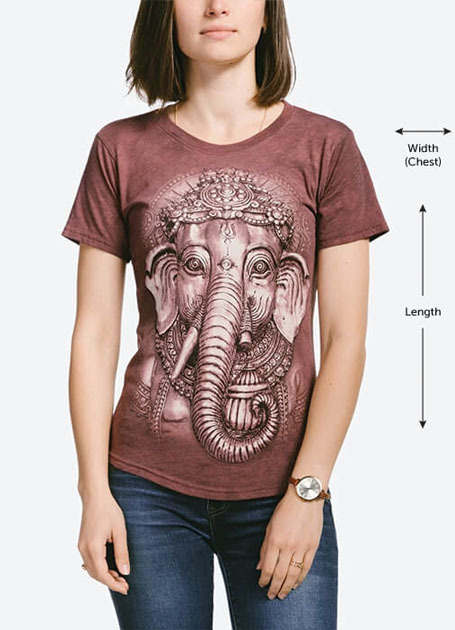 We recommend that you take a t-shirt of your own that fits perfectly, lay it on a flat surface, and measure from where the neckline meets the shoulder seam all the way down to the bottom hem. This will give you the length. Then place the measuring tape 1 inch below the armpit seam and measure left to right, giving you the width. 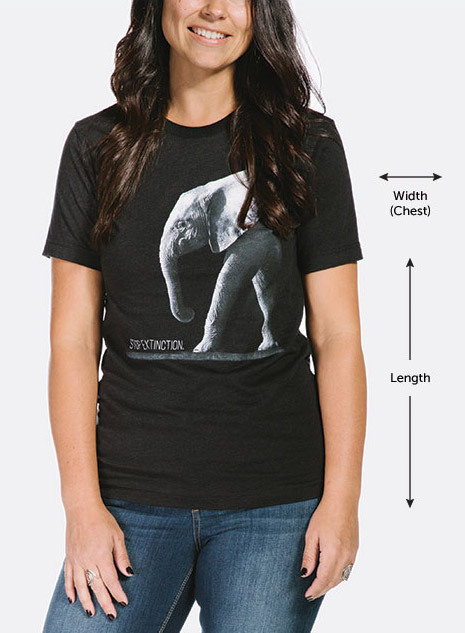 From there you can reference our sizing chart to determine the best fit:http://www.themountain.com/sizing/. 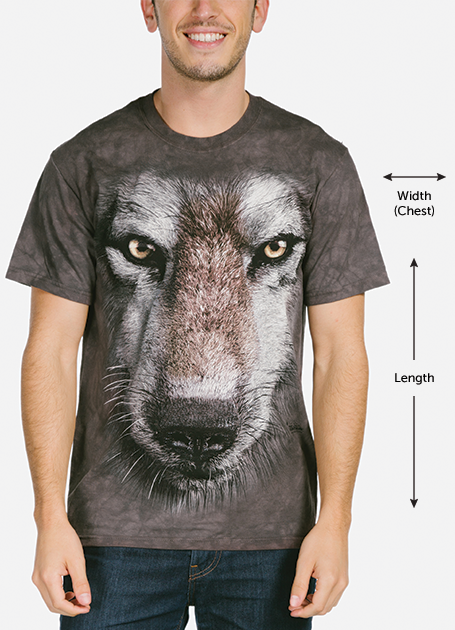 Please note: Due to the manufacturing process of our t-shirts, we have an allowable size variation of 5% in width and 7% in length for all our products. How come the shirt I received looks slightly different than the shirt on your website? A. Each shirt is 100% hand-dyed and truly unique. Computer screens can also render colors differently. We hope you love the special shirt we made just for you! Why is The Mountain logo printed on the t-shirt? A. This labeling initiative helps protect the integrity of our brand from counterfeit products being sold through various mega-retail websites and marketplaces. With that logo, you can trust that your shirt is top quality, comes with a 100% satisfaction guarantee and a high level of customer service. A. Just one per order, my friend. A. We accept all major credit cards and PayPal. We are also currently considering cute kittens as a valid form of payment - stay tuned! Why is there an error when processing my credit card payment? A. Check to make sure the billing address you have entered matches exactly to what the credit card company has on file. Why is there an error when processing my PayPal payment? A. The most common issue is that PayPal blocks transactions that have an unapproved shipping address. If you change your shipping address to match your billing address it should allow completion of your order. Why was my order flagged? A. Something didn't look quite right to our robots, so our humans are going to double check the details of your order for anything amiss. We will contact you if there is indeed an issue. A. We process a ton of orders, and although you are very important and beautiful, we are not able to make any changes to an order once it has been processed and entered the big wide world of warehouse land. Make sure to confirm your order details (size, body style, billing and shipping addresses, etc) before you checkout. How come I can't log in to my account to check the status of my order? A. If you checked out as a guest, an account was not created! Give us a call and we'll happily give you a status update. What happens if something I ordered goes out of stock and it can't be shipped to me? A. In most cases, we will remove that item from the order and issue a refund for it. Where can I find answers to all my shipping questions, including international shipments? I placed an order through a 3rd party retailer. Can I return or exchange with you directly? A. If we didn't make the sale, we can't make the return or exchange! Please work directly with the company from which you purchased the item. A: If you made a purchase directly through TheMountain.com, please see our returns page. If you purchased a The Mountain brand product through a 3rd party retailer (for example a seller on Amazon or Clothing Monster) you will be subject to their returns policy. Please reference the store that you purchased from for furthe r details. I placed an order through a 3rd party retailer, why can’t I return/exchange it through you? A: Unfortunately, because you did not purchase the shirt directly through this website, we cannot process a return/exchange for you. You will need to directly contact the seller that you purchased the shirt from in regards to receiving a replacement. If the seller is unwilling to work with you regarding the issue, please contact our wholesale department. Their email address is: sales@themountain.com. They will be able to assist you further. Are there special washing instructions for your awesome t-shirts? A. When you first receive your The Mountain apparel we recommend washing in cold water alone or with like colors. Since your apparel was hand-dyed it will continue to bleed some excess color for the first few washes. It is safe to use normal detergent, just make sure to avoid bleach. Your Mountain apparel should be dried either in a tumble dryer or flat. I’m an Influencer, blogger, and/or YouTuber and I would like to work with The Mountain to review your products or to collaborate with you on a project. Would you be interested in collaborating with me or sponsoring me? I really like your community and sustainability values (https://www.themountain.com/our-values/). Would The Mountain take part in my fundraiser or charity event? A. We might! Send some details over to our Media Team at social@themountain.com. 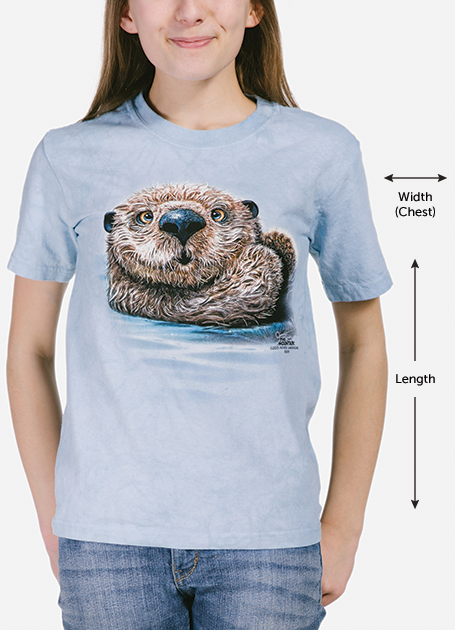 How can I suggest a t-shirt design for a particular animal? A. What? We don't already have that? Send your idea to social@themountain.com! Do you have a printed retail catalog I can order? 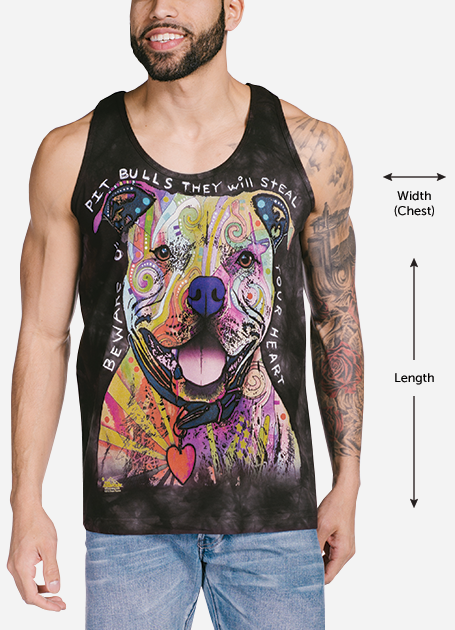 How can I create a wholesale account and resell your shirts at my store? A. Head on over to our wholesale website to learn more. How can I unsubscribe from the coolest e-mails ever? A. To unsubscribe from our email newsletter, please click the link at the bottom of your last e-mail from us that says "If you believe this has been sent to you in error, please safely click here." Didn’t see your question in the sections listed above? Contact our Customer Service team by emailing retail@themountain.com or calling 1-877-686-8337. We’re open Monday - Friday 9 AM - 5 PM EST. 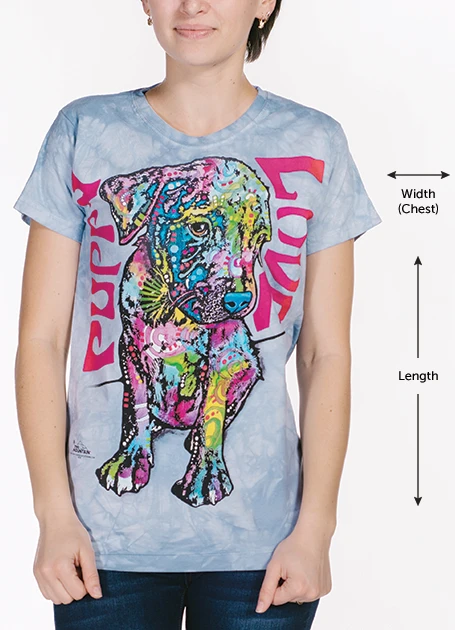 Our "Kid’s" t-shirt is our classic unisex style t-shirt suited for both girls and boys. Our "Hoodie" sweatshirt is our classic unisex style sweatshirt suited for both men and women. Our "Youth Hoodie" sweatshirt is our classic unisex style sweatshirt suited for both boys and girls. Our "Long Sleeve" t-shirt is our classic unisex style t-shirt suited for both men and women. 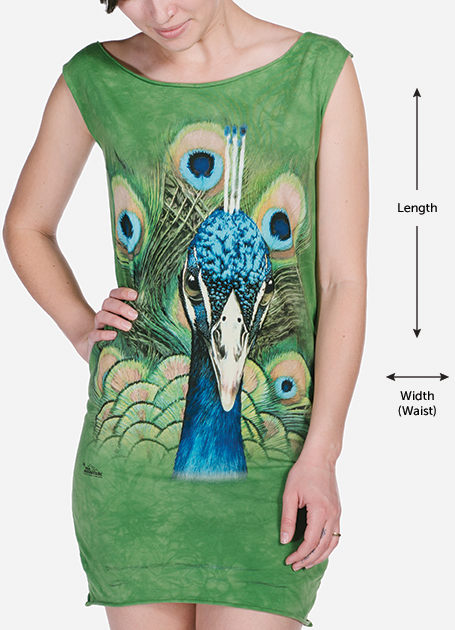 Our classic unisex style Tank is suited for both men and women. The Mountain is committed to providing you with top quality apparel. All our products are dyed, printed, and inspected by a dedicated team in our Marlborough and Keene, New Hampshire facilities. Each garment is completely looked over for imperfections after the dying process. There is an additional inspection after the printing process. A final inspection team scrutinizes meticulously to catch anything that might have slipped through production. That being said, we are a team of humans, and occasionally a mistake is made. If there is any question, concern, or problem, please tell us! We want to know where, how, why, when, and what we messed up so we can fix it. Please contact us immediately if there is an issue with your Mountain apparel so we can help resolve. Our Customer Service Team is available Monday – Friday, 9 AM to 5 PM EST and can be reached at 877-686-8337 or retail@themountain.com. Please note that we do not ship on weekends or US holidays. When placing your order, please review your shipping address carefully. Shipping fees are non-refundable. The Mountain is not responsible for lost or returned items/packages due to address errors. If you do not receive your package please contact the shipping provider or check with your local post office. If you think your package is lost, please contact retail@themountain.com with your order number so we can investigate and determine if the package can be retrieved or found. If the package cannot be found, we will create a case with the shipping company, this process can take 2 -3 weeks once it is reported to us. Orders are shipped by a carrier of our choice (either USPS or FedEx) and can take up to two weeks for delivery. Orders may be broken up into multiple shipments depending on stock location. Orders can take up to 10 business days to process before shipping for made to order or custom items. An order can only be edited on the same day that it is placed. Expedited shipping options are available at checkout. We are happy to extend our discounted FedEx rates to our customers at check-out, and prices are calculated by the weight of items and your location. Please note that all expedited orders ship on the next business day; we do not ship on weekends or US holidays. If you place an express order on Friday, it will not ship out until Monday. FedEx does not ship to P.O. Boxes. If you choose a FedEx expedited option and enter a P.O. Box, we will ship your order using USPS Express. Once your order ships, you will receive an automated e-mail with tracking information. Please allow up to 24 hours for that tracking information to update. Tracking numbers beginning with 940 or any letter can be tracked at www.usps.com. Tracking numbers beginning with 605 or 771 can be tracked at www.fedex.com. All international sales from themountain.com are final. Please note that we do not ship on weekends or US holidays. If an item you ordered is out of stock, we will contact you and provide an approximate date of shipment or assist you with selecting an alternate item. When placing your order, please review your shipping address carefully and be sure your country's postal service delivers to the address exactly as you have provided. Please include a daytime phone number where you can be reached in case delivery problems arise. If a package is returned to The Mountain for any reason, a refund will be issued for merchandise only. The returned package will not be re-shipped. Shipping fees are non-refundable. By completing your order, you agree to become the importer of record for your order. In doing so, you assume full responsibility for any additional import charges. The Mountain does not pay import taxes, duties, or brokerage fees, nor do we include them in our shipping rates. For an estimate of these fees, please contact your local Customs office. You will need to pay these fees for your package to be delivered. If the shipping carrier is unable to collect duties or brokerage fees associated with your order, the package is abandoned. No refund is issued in this circumstance. Returns and exchanges are not accepted for international orders. If your order contains incorrect or defective items, please contact us (retail@themountain.com) within 3 business days of delivery and we will happily help resolve the issue. International orders are shipped by a carrier of our choice, either United States Postal Service (USPS) or FedEx International Mail Service (FIMS). Both carriers deliver to your local Customs agency who will then distribute to your local postal service for delivery. All orders are shipped from our warehouse in Keene, New Hampshire. All international shipments are subject to delays in Customs and therefore delivery dates are estimated. USPS Express Mail: 5-10 business days for delivery and includes tracking information provided in an automated e-mail once the order ships, trackable at www.usps.com or via tracking link in your shipment confirmation. USPS Priority Mail: 1-3 weeks with no tracking information. USPS First Class: 2-3 weeks with no tracking information. Returns are accepted up to 30 days after delivery date for a full refund of merchandise. Original shipping charges are non-refundable. Refunds for merchandise are issued to the original form of payment. All sales are final for items marked as clearance and outlet. If your order contains incorrect or defective items, please contact us within 3 business days of delivery and we will happily resolve the issue. Our Customer Service Team is available Monday – Friday, 9 AM to 5 PM EST and can be reached at 877-686-8337 or retail@themountain.com. All returned merchandise must be unused and unwashed. Any returned products showing signs of wash or wear will not be refunded and will be donated to a local charity. If merchandise is returned beyond the 30 day period, or otherwise ineligible per our policy (such as clearance, made-to-order, and international), a store credit will be issued for the cost of the merchandise only. Tax and shipping costs will not be refunded. The returned product will be restocked or donated upon receipt, and will not be eligible for reshipment. Please allow 3-4 weeks to process your return or exchange. If you require an exchange sooner than 3-4 weeks, simply place a new order online and return the unwanted merchandise for a refund. Should any issues or questions arise regarding your return or exchange, you will be contacted via e-mail. Be sure to add The Mountain to your approved sender list as some e-mail providers may filter as spam. The Mountain is not responsible for lost or damaged return packages, and we advise selecting a shipping method with insurance and tracking. The customer is responsible for return shipping costs. If you are returning for an exchange, The Mountain will cover the cost of shipping the replacement item back to you.